Spending only one day in Florence, or Firenze, as it is called in Italy, is almost overwhelming. Florence is one of the most beautiful, fascinating, and popular cities in Europe for travelers. Because of this popularity, many cruise ships sailing the Mediterranean include Livorno, the nearest port to Florence, as a stopover. Even very small cruise ships cannot sail up the Arno River to Florence, so after docking in Livorno, you will need to ride a bus the 1-1/2 hours into Florence for a full day shore excursion. Florence is located in the north-central Tuscany region of Italy. The Renaissance was born in Florence, and the city has long been famous for its museums, universities, and architecture. The powerful Medici family exerted their influence over the arts and the politics of the city during the 15th century. Some of the most talented of the Italian artists of the Renaissance lived and worked in Florence at one time or another - Michelangelo, Leonardo da Vinci, Raffaello, Donatello, and Brunelleschi - and all left their mark on the city. Florence has had its share of tragedy along with its artistic glory. During World War II, the Germans blew up every bridge over the Arno except the famous Ponte Vecchio. In 1966, the Arno flooded the city, and Florentines found themselves under 15 feet of mud, and with many of their art treasures damaged or destroyed. Cruise ships port in Livorno and usually offer day trips to Pisa or Lucca in addition to Florence. You will pass by both of these on the drive to Florence. It's a long drive for a day trip, but well worth the effort, although you'll wish you had more time. Tours often stop first at a park overlooking the city where visitors have a sweeping panoramic view of the city. When you look at a map, most of the "must see" sites are within an easy walking distance of each other. This is important because Florence doesn't allow buses into the city center. However, the walking is slow and easy, although some of the streets are somewhat rough. One lady in a wheelchair navigated the tour just fine, although she did need someone to push her chair. Let's do a short walking tour of Florence. Cruise ship tour buses usually drop off their passengers within a couple of blocks of the Academy of Fine Arts (Academia Gallery), one of Florence's best museums. This museum is the home of Michelangelo's famous statue of David. Some people are somewhat disappointed by this amazing statue of David and the other sculpture and artwork in the Academy because you really can't get a close, much less a lingering look at the masterpieces in the gallery if you visit during the busy summer season. 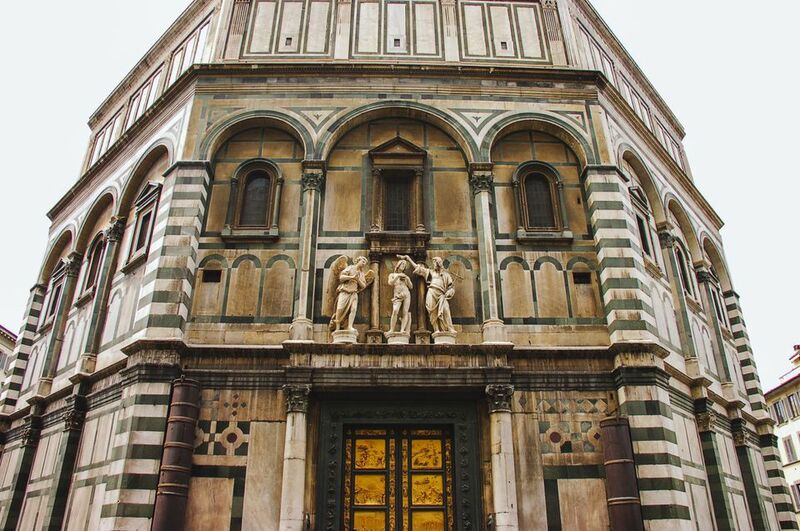 After touring the gallery, it is a short walk to the Duomo, Florence's cathedral. The cupola dominates the skyline view of the city of Florence. The cupola is an architectural wonder and was completed in 1436. Brunelleschi was the architect/designer, and the dome served as an inspiration for Michelangelo's St. Peter's Cathedral in Rome and the U.S. capital building in Washington, D.C. The exterior of the cathedral is covered with pink and green marble and has a wonderful look. Since the interior of the cupola was covered with murals, it looks a little like the Sistine Chapel in Vatican City. Tour groups take a break for a delightful lunch in Florence, some at an old palazzo. The room is filled with mirrors and chandeliers and looks very Florentine. After all the walking and sightseeing, it is nice to have a break. After lunch, there's time for more touring on foot, walking by the Palazzo Vecchio with its replica of Michelangelo's David and along and through the piazzas of the city. After touring the Church of Santa Croce, guided tours end at the busy Piazza Santa Croce with free time for shopping. The Church of Santa Croce contains the tombs of many of Florence's famous leading citizens, including Michelangelo. The Franciscan monks operate a leather-working school behind the church and many their shop. The leather is wonderful, with goods ranging from leather coats to briefcases to wallets. The Piazza Santa Croce is home to many jewelry shops and artists. The old bridge called the Ponte Vecchio is lined with jewelry shops, many selling golden goods. A full day in Florence does not allow enough time to see all of the impressive museums and architectural wonders. However, even just a "taste" of Florence is better than nothing.